Northern Ireland tide tables now aded. Handy site for making sure your tent wont blow away! Just a wee note that the first link for Bangor tide times is actually for Bangor, Wales rather than Northern Ireland. I thought something was up when the description read "The university city of Bangor..."
BBC also produce tide times for various locations around N.I. The tide charts are quite handy for visualising things and comparing the differing depths. Linky here. I wonder if tackle shops still do the wee booklet of tide times? I remember I used to get my tide time tables from Trap & Tackle in Bangor, and all you had to do was make a donation to the RNLI. I suppose most people just look them up on t'internet now. You appear to be right, but the tide times they show seem to be identical to the Bangor NI times which is odd. For anyone who need tidal predictions for future dates try the WXTIDE 32 download. They are available from somewhere 'cos my old man still has a set on his mantlepiece. you can sign up for email alerts of weather warnings, very handy if you have email on your phone when you are camping and things change for the worst! 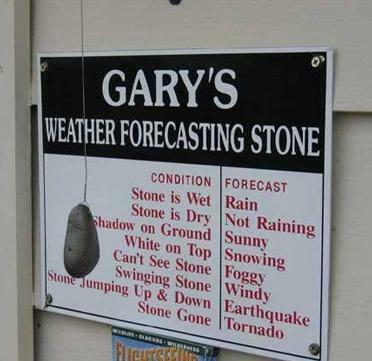 Gary's weather forecasting stone's brilliant! It's killing me that Metcheck has been down the last couple of weeks. I've really started to trust it (only let me down once planning an overnight) Anyone know if their premium service still works? Update: DEC2011 MetCheck is now working again. If anyone wants the current weather in Bangor check below.